Tongue Piercing is an oral piercing done usually through the center of the tongue. It usually refers to a piercing of the tongue from the underside, vertically through to exit from the surface of the tongue. Standard tongue piercings, or one hole in the center of your tongue, is the most common and safest way to have your tongue pierced. It is considered to be one of the least painful piercing. The different colors of beads at the end of the barbell gives the individual a pretty and unique look. How is the Tongue Piercing done? One needs to research and find a professional piercer with a good portfolio and credentials. The piercer will check the underside of the tongue for large blood vessels, sometimes with a bright light, and mark a safe placement for the piercing. The tongue is then clamped with forceps and pierced with a needle, usually from top to bottom with a piercing needle or from bottom to top with a cannula needle. The center of the tongue is marked using a toothpick and indigo ink, which will mark the area where he or she will make the piercing. Stick your tongue out so the professional can clamp it. Sit absolutely still as your tongue is pierced. Breath in and out as the procedure is done. Be as calm as you can to make it easier on you and the piercing professional. Obtain a cup of crushed ice and put a metal teaspoon into the cup. After the teaspoon is cold enough, press the teaspoon onto the pierced area. The swelling will go down considerably by this. The kit contains these one-time use equipments except the forceps which, if autoclaved, maybe used again and again. Generally, a tongue piercing is along the midline of the tongue, in the center of the mouth. It is often approximately .76 inches (1.9 cm) from the tip of the tongue. It is placed as such which allows the top of the jewelry to lean slightly back, away from the teeth. It is also usually positioned just in front of the attachment of the lingual frenulum.A tongue frenulum piercing is a piercing through the frenulum underneath the tongue, known as the frenulum linguae, and commonly the tongue web piercing. “Venom bites” is the term given to two tongue piercings placed side by side on the tongue, which are considered to be more painful than a regular tongue piercing through the tongue’s center. There is also the “snake-eyes” which is one curved bar going horizontally through the tip of the tongue, it is mostly painless other than a mild amount of pressure. The toungue pierces are not as painful as the other body pierces. This oral piercing is a very quick pinch, it hurts less than biting the tongue. It is the healing process that is very painful. The tongue is going to swell to almost double its size and thus eating solid food comfortably might be a problem. The initial presence of barbell in mouth might seem uncomfortable but after the tongue resumes to its normal size and the barbell is changed, you’ll get use to it and forget its there. After 4 to 6 days the tongue will start to feel better, tongue heals very fast. There are various blood vessels in the tongue which is why it is generally pierced on the tip or middle where the tongue is thinner or with lesser vessels respectively. If the bleeding exceeds 20 to 30 minutes then immediately the person need inspection. It should be made sure that Listerine is not used as it contains alcohol which considerably thins the blood. Red Streaks: If red streaks are radiating out of the piercing hole and running down the sides and front of the tongue, then there is some advanced infection going on, seeking immediate antibiotic treatment. This might be accompanied with pain and fever. Bleeding: Bleeding that occurs after the initial healing process has completed is instead another sign that indicates an ongoing infection. Discoloration and Discharge: Any extreme discoloration of the tongue (green, yellow, purple or black) should be taken very seriously, as it indicates the advanced stage of an infection. In this case it is necessary to seek immediate medical attention. Discoloration may also be accompanied by yellow or green discharge, which is the pus that comes out of the infected area. This also requires prompt and adequate antibiotic treatment. Such oral piercing might lead to some other problems if not well taken care of. It might cause various dental and gum issues. It could also chip your teeth and mess with your gum. It increases your frequency to brush for hygiene purposes. One should make sure that the equipments used are completely sterile else it might lead to HIV. The inability to swallow or in extreme cases, breathing difficulties due to severe swelling of the tongue, paralysis of the tongue muscle, a spreading tingling feeling, numbness and infection are other demerits. In many cases it is seen that the risk of infection never truly goes away, as there have been some cases of a long-term wearer who has had to remove the piercing due to a delayed infection. Another more common risk is the ingestion of dislodged jewelry. Should the piercing come loose, it could be swallowed. 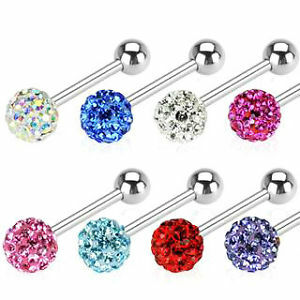 Tongues are pierced with straight barbell style jewelry. Because of the frequent movement of the tongue, jewelry size and comfort is especially important. Few people find barbells too thin for their piercing. It is possible to stretch further to diameters beyond 10 mm. The beads at the end of the barbell can be made of many decorative materials. “No-see-um beads”, flat beads matching the color of the tongue, are sometimes worn to conceal this piercing, often in places of employment. The tongue balls are another piece of jewel. These ornaments can be made of gold and other metal. How Long can a Tongue Piercing Last? This oral piercing varies from people to people. It has been seen that the hole closes within two days and for some people, it may take years. It completely depends upon the healing and type of person. Retainers can be further used if you are temporarily not using barbells or tongue balls. Such retainers may be available anywhere online or in tattoo shops. How to Take Care of the Tongue Piercing? These piercings can take 3 – 4 weeks to heal completely. It is one of the fastest healing piercings. Swelling generally lasts for the first 10 – 14 days. One should take proper care of this one of the most sensitive areas of our body. One must mouthwash daily for four to five times daily for about 60seconds, including after meals and bedtimes. Avoid using any mouthwash which has alcohol in it. The outside of the piercing must be dabbed with sea salt about two-three times daily, followed by washing it with an anti-microbial soap. The piercing shall not be touched except for cleaning.The hand must be always washed with anti bacterial soap before cleaning or touching the piercing or the jewelry. The Piercing must be dried after cleaning with a paper towel or napkin instead of a bath towel or a cloth which can contain germs and bacteria. Price should be the last criteria for choosing a place. The tongue is a very important part, and it should be given the best. As per information, tongue piercings can cost as much as 30-60 dollars. One should find a place they’re comfortable with, that’s clean, with trustworthy piercers. Making sure their equipments are autoclaved. Spicy, salty, hot, hard or acidic foods should be avoided during the healing period. These can cause stinging and burning sensations on and near the piercing. Tobaccos, oral sexual contact, kissing, alcohol, chewing gum, playing with jewelry during healing and a large amount of caffeine should be forbidden. The original jewelry must be replaced with shorter jewelry after the reduction of the swelling. Even if proper care has been taken, it still may have a whitish goo come out of piercing hole, this is not always infection. It should not be given a deeper thought.